I would like to bring to your attention a wonderful game I very recently found (even though it's 4 years old). The name of the video game is Osu! and the best way to describe it is a mouse-version of Guitar Hero. There are also a ton of beat-maps to download, however most of the music is anime-japanese or techno (still searching for some good-ol Pink Floyd maps ^^). So now you might ask, why Berlinia, oh overlord of the master class, do you do free advertising on their game. The answer to that is that I sincerely believe that playing the game will make you a better WoW player. Let me elaborate on that. The game is fast paced, and especially on the higher levels thing happen rapidly. What I notice myself is that right now, during farm I only raid 1 night every week. The result is that I slowly lose my focus and attention on the minor things that happen, while also keeping in consideration the global picture of the encounter. Due to the nature of Osu! you are specifically put in a mindset of watching the global picture AND focusing on the details. I believe that playing the game makes you a better raider and that's why I recommend it. What i started doing is play 30 minutes of Osu! before every raid and obviously I have played my fair amount after but.... i'm rambling. By playing 30 minutes before the raid you already put your mind in the necessary state to actually perform well. Finally someone who plays Osu! here. There's a thread over at MMO-C, but it's relatively dead, and only a few people post every now and then. I've started calling it connect-the-dots put to music myself. As to improving focus, I definitely agree, and I would say it improves awareness even more so. I've played beatmaps where you have less than 0.5s to go from one note to the next and they're in opposite corners. Or there'll be 3 notes that you have to hit in a very short amount of time (triplets, and longer streams). You really have to pay attention to whats going on to play well. Another thing that I like are the marathon maps. Songs or collections of songs that total up to be 5 or 6 min to 11+ min long which really test endurance and stamina. As in, can you continue to react fast after 5 min of reacting fast with little to no downtime. 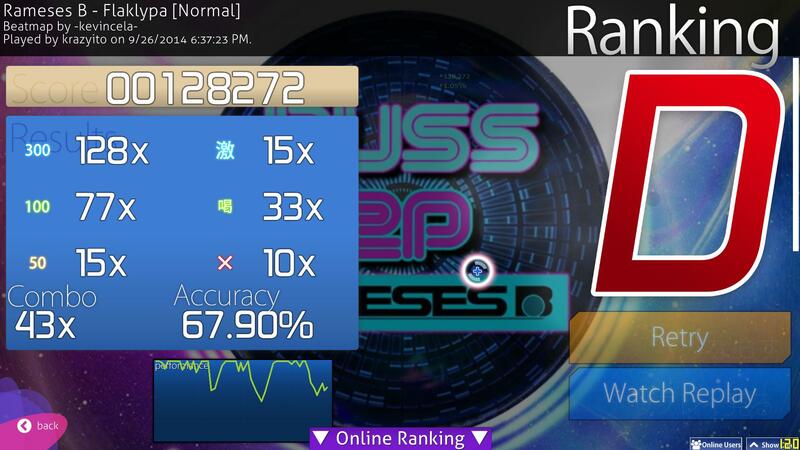 Lol, you'll see what I mean once you start playing harder/faster beatmaps. If my video card supported recording videos, I'd do that for a few songs that I have, but alas, I'm stuck with engineering some way of recording it on my phone and hoping it turns out well. Edit: Actually, if anyone wants to see how I did on any of my top ranks, I can save the replay and *hopefully* upload it here. Or on any of the songs that I have for that matter. I mention top ranks, since that's where you can see what songs I have. Lol, sliders are click and hold til the end. You'll see some that have little stars or dots in them (depending on what skin you are using) that count toward the combo and if you aren't holding down whichever button (whether its the mouse keys or ones on the keyboard - I use q and w myself) when the ball passes over it the combo is broken.